Seriously? Well, why not? The Obamas put Mao ornaments on their Christmas trees, so why wouldn’t they give a middle finger to President-elect Donald Trump and hang a portrait up of Hillary Clinton prominently among various Christmas decorations, above a fireplace in the Cross Hall. No pics of Bill Clinton or Chelsea, no… a portrait that looks suspiciously like a presidential portrait positioned strategically to make a point. The election was stolen from the real president. Give me a freaking break. Hillary Clinton didn’t win the presidential election. It would have been far more appropriate and conciliatory to hang a portrait of the Trumps as the incoming presidential family. Christmas is a beautiful time at the White House. It honors so many things, from family pets to the military and especially the Constitution and the Founding Fathers. It is a time of giving and kindness… not a time that you make a political statement and shove it in the new incoming President’s face. It’s rude, bad manners and inappropriate in the extreme. Hillary Clinton may not have won the race for the White House, nonetheless she will be on prominent display in it during the Christmas season. 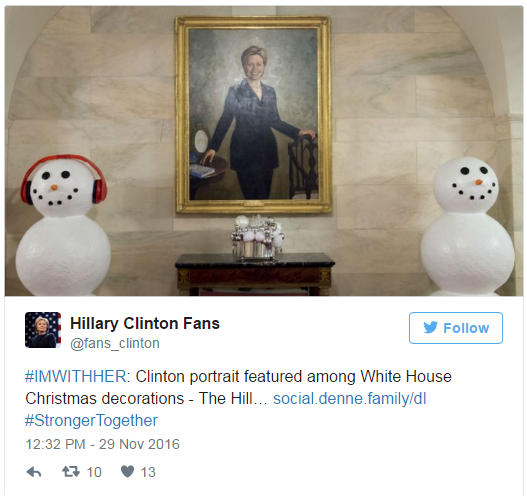 “An official portrait of the former first lady and Democratic presidential nominee is hanging in the Cross Hall of the White House, displayed alongside an array of bells, baubles and other holiday décor,” The Hill reported. “A tree adorned with gold stars represents ‘The Gift of Service,’ which pays homage to first lady Michelle Obama and Dr. Jill Biden’s Joining Forces initiative, aimed at supporting military service members and their families. Kiosks with touch screens can be used to pen a note to send to troops,” The Hill added. 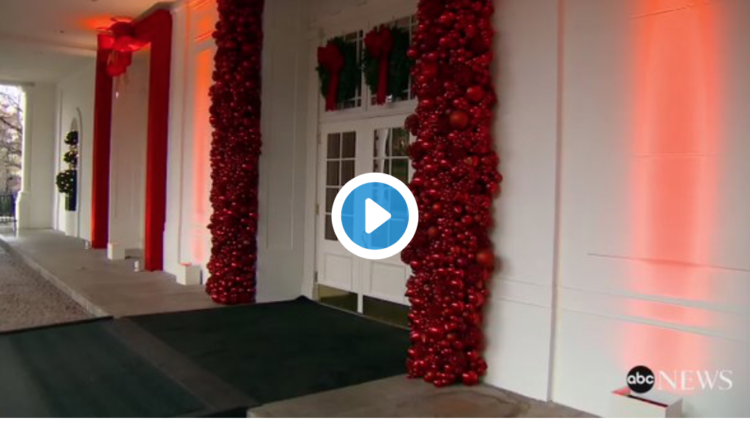 The decorations also include the first dog-inspired creations: the first family’s pooches, Bo and Sunny, made with more than 25,000 yarn pom-poms. Additionally, 56 gingerbread houses adorn 1600 Pennsylvania Avenue — one for each state and territory in the U.S.
ITK spotted the portrait, one of several paintings of presidents and first ladies adorning the walls at 1600 Pennsylvania Ave., when the White House opened its doors Tuesday for a sneak peek of its annual Christmas decorations. The 2003 painting by Simmie Knox shows a smiling Clinton sporting one of her signature pantsuits, standing by a table with her book, “It Takes a Village,” by her side. Marxism right up until the very freaking end. The White House calls this year’s theme “The Gift of the Holidays,” one that “reflects on not only the joy of giving and receiving, but also the true gifts of life, such as service, friends and family, education, and good health.” They should also add the gift of political propaganda and revolution. Oh, and the very real gift of Hillary Clinton NOT be elected president. Something to be thankful for after all.